Soak 1 cup of lentils overnight in cold water. Drain and place them in a large canning jar or jars. Cover with nylon screening or stocking material and replace the ring to keep the screen in place. Roll in a towel and leave on its side on counter top. Rinse with lukewarm water twice a day. By the third day, the sprouts are well grown and ready to eat. Cooking Method: Place ½ cup water in a skillet. Chop 1 large onion, ½ green or red pepper and sprouted lentils. Sprinkle with about 2 tablespoons Braggs and cover. Simmer 10-15 minutes, stirring occasionally. Do not cook until soft. Sliced almonds and mushrooms or celery can also be added if desired. 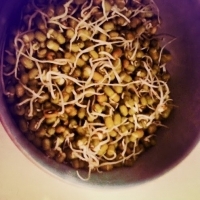 Remember – sprouting increases the food value as well as the amount.